The Gray Report: Louis Jadot "accepts the vintage"
The small commune of Pernand Vergelesses has better known neighbors, as it's between Aloxe Corton and Savigny Les Beaune in northern Burgundy. The sample was toasty and lemony, with a nice mouthfeel, delivering presence without too much weight. Round and seamless. Lardiere says, "We do no battonage. It's bad with the high acidity. We prefer to keep the wine longer on the lees. Wine is better made slowly, for the harmony." Seems like pretty good value in a white Burgundy, considering what you might pay for an Aloxe Corton. 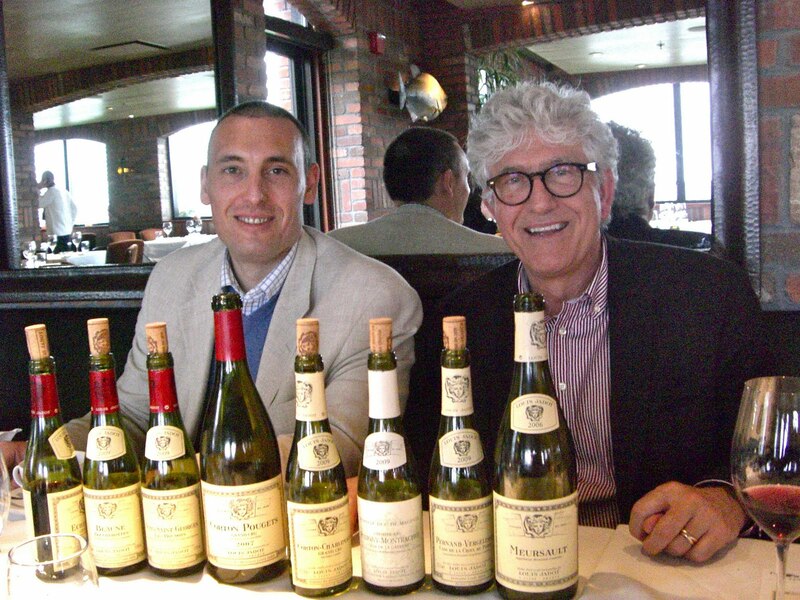 Puligny Montrachet is one of my favorite regions in Burgundy; I think many people who like California wines would say the same. The wines tend to have a fresh fruity character with some richness, and are usually approachable without being excessive. This wine is medium-to-full bodied and slightly tropical, with some pineapple notes atop more characteristic citrus. It's pretty big in this ripe year, and out of barrel I preferred the much cheaper Pernand Vergelesses. At that price it ought to be delicious, and it is. The primary flavor is toasty, expensive oak, but there's also bright fruit. Imagine a piece of artisanal wheat bread toasted on an open flame and spread with a thin layer of Meyer lemon jam. It's the breakfast of kings in a bottle. This is a hard wine to evaluate because the barrel sample I tasted didn't seem close to ready. It smelled underripe and tasted of black currant fruit with some black licorice and herbal notes. This wine comes from a vineyard right on the other side of the wall of what might be the most overrated vineyard in Burgundy, Clos Vougeot; you'll do better to buy outside the wall than in. It's drinking well out of the barrel, with notes of dark cherry and violet, a strong earthiness and a savory, peppery finish. It was the most exciting of the red wines I tasted with Lardiere, including some that had already been released. I love the Francophilic naivete. To celebrate the wines of Lardiere is incredibly worthwhile. To couch them in language that what he does is "the crux of Burgundy" when so many other winemakers in Burgundy approach things differently is naive. And to say that such a commitment to terroir is "unimaginable in California" ignores folks like Brewer-Clifton who follow the same philosophy. Adam: I'll stipulate to naivete, it keeps me young, hopefully. But you've been reading me long enough: Francophilic? Really? Don't I wave the Star Spangled Banner often enough for you? Name me a California winery as big as Jadot that would simply accept a lesser vintage as different and not try to tart it up somehow. You are right....I can't name a winery as big as Jadot that chooses to be less involved in the winemaking process (I will leave it to you to describe winemaking processes as "tarting it up."). But I will also say that your choosing to take Lardiere's winemaking philosophy and describe it as "the crux of Burgundy" or "as the heart of what differentiates Burgundy from everywhere else" when many in Burgundy (and many great wines) are made with differet philosophies. That exaggeration strikes me as Francophilic (they'd be thrilled with it) --- even though I don't think you are such a character generally. PS -- One other thing...I have heard Lardiere speak very elequently about the changes and improvement in viticulture in Burgundy over the last several decades. I agree wholeheartedly, but it does make me wonder where your interpretation of "accepting the vintage" begins and ends. Adam: We can fight more tonight, but then how will that look when we're on the same side in tomorrow's blog post? It is the perfect lead in, shows objectivity! I've gotta break up this love fest, you two . . . Though I am not as 'learned' as Adam is on world wide wine practices, the concept of 'accepting the vintage' is nothing new, though it may seem quite fresh given today's penchant for creating 'consistent' wines. My guess is that if you dig a little deeper, you would find domestic wineries large and small that accept the fact that grapes are not much different than other farmed crops, and some years you'll be able to start with 'better' grapes and others 'not so great' (with the caveat that 'great' is a relative term anyway). Carry on, you two . . .
Vintages vary in terms of the characteristics of the grapes they produce. Domaines wish to have "house styles". These styles reflect the desire of the domaine's management to have a stylistic signature of aroma, palate, balance etc. It has evolved over time but is not fixed. The house style is such that the wines of the house reflect the origin, the house style and the vintage. And you characterize that as integrity rather than rigidity--am I getting this correct? Tercero: The key difference in philosophy here is "start with." Seems to me that most California wineries see each year's grapes as the starting point. I cannot tell you how often I hear that somebody uses a proprietary nickname for an expensive red, rather than a vineyard name, because "We want to be free to make the best wine every year, using whatever grapes we have to." It's just a different philosophy. David: You are not correct. Did I characterize it at all? Show me where I used the word "integrity" or anything like it. So Blake, some are saying that accepting the conditions of the vintage is a good thing. Are wineries then compelled to release smoke affected wines which would surely reflect "the conditions of that vintage"? And are consumers thus compelled to appreciate them because they correctly reflect those specific vintage conditions? If not, where does the slippery slope begin/end? David: I suppose I could have, and maybe should have, used a more neutral expression than "tart it up." I might have included more wines by saying something like "made adjustments that improve the wine's overall flavor, at least in the short term, while diminishing its pure vintage character." Chuck: I believe that should address your question. It's just a philosophical difference. I'm a wine geek: I find the kind of blended, solidly drinkable, ordinary red wines that most American wineries strive for in off vintages to be boring, whereas most consumers would be perfectly happy with them. And as I've established with Adam, I'm not a Francophile -- you know that well too. I'm just making an observation. Would I personally rather drink a less perfect wine that really tastes like the vintage? Maybe. You bring up a good example: I want to try those smoke-affected wines, and I'm not enthused by trying them after they have been through reverse osmosis or whatever else is being done to them.